There must be something deep in the primordial souls of girls in their early teens to be drawn like a magnet to certain individuals of similar age, whether a rock star or movie idol or perhaps just someone who looks and acts very cool. November 11, 1955. We still called it Armistice Day, although this national holiday was renamed Veterans’ Day just the year before. On that day, Sharpsville, like many other towns and cities across the country, commemorated the World War I peace agreement with an Armistice Day Parade down Main Street. My girlfriend JC and I were just happy for a day away from school. Shivering in the brisk cold air of a Friday afternoon, we joined other onlookers next to a judge’s stand set up in front of the Gordon Ward Appliances store. The usual flag-waving and baton-twirling groups, veterans’ clubs, and civic organizations stepped smartly past us, including the Sharpsville High School band and a marching unit from George Junior Republic, a nearby boys-only institution. Then one particular group grabbed our attention. To us, there was nothing “usual” about this regiment of approximately 40 young guys in uniforms nor their name and origin. 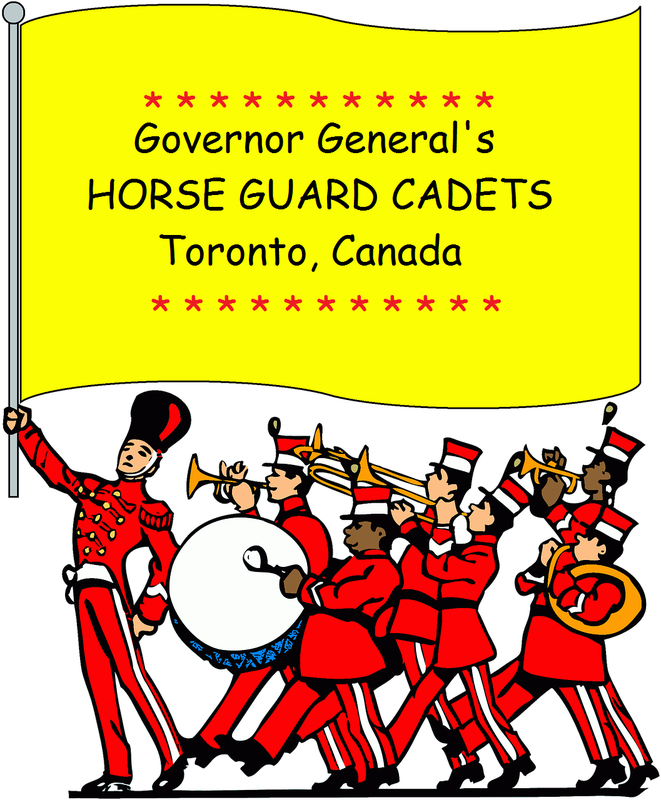 As their banner told us, they were cadets affiliated with Governor General’s Horse Guards in Toronto, Ontario. I learned much later that the Horse Guards had a long history of active service in the defense of Canada. Since WWII, the organization volunteers its service on United Nations missions augmenting Canada’s Regular Army. The boys in this parade weren’t riding horses, but their red and blue uniforms and soldierly bearing were quite enough to impress us. When the last of the parade passed by, JC and I headed for the football stadium to watch a special marching exhibition by the cadets scheduled for later in the evening. On the way, we kept our eye on those Canadian boys who were milling about, their brightly-colored uniforms standing out on the wintry gray streets and sidewalks — and who were also watching us. We soon came upon two other school friends, JW and JG, who shared our interest in these visitors from another planet. JW, the more brazen of the four of us, summoned enough nerve to call out to several of the cadets complimenting them on their marching. This was all that was needed for several of the boys to cross the street and join us. Then the fun really began. For the next several hours, we walked around town, talking and laughing and joking and teasing, until we ended up at JG’s house, tired but too engrossed in each other to give up yet. One of the boys had a camera that was passed to JG’s mother to record our get-together in black-and-white photos, which served forever after as confirmations of this momentous occasion. But all good times have an ending, and, like Cinderella’s, ours ended at midnight when the boys courteously walked us to our respective homes. My house was located next door to a dance hall that my Dad owned. There, a reception was being held for the parade participants, complete with food and dancing. Larry, the guy I found myself paired with by that time, and I stopped in and he introduced me to even more of his cadet buddies. When one of the boys asked me to dance, I felt as if I were in a Disney movie. When Larry and I finally arrived at my door he asked for my pink chiffon scarf “‘cause in Canada that’s what the girls give to the boys.” He gave me his address and said “so long” instead of goodbye because “saying goodbye would mean forever” and he planned to return in a few months. What lines! But I soaked them up like a brand new sponge. 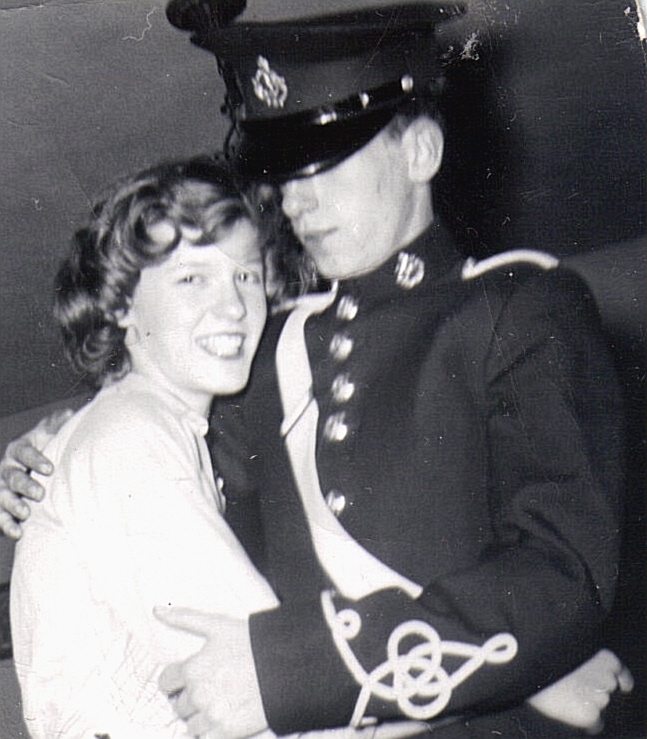 In my next diary entry, dated Monday, November 13, 1955, I gushed, “All us kids do now is talk about those Canadians. And no wonder! They beat Sharpsville boys by a mile.” Of course, the cadets had the advantages of being exotic “foreigners,” looking smart, and, above all, they had paid flattering attention to us. We never tired of going over each detail of that night — as we met at Sandy’s over pizza or at Crick’s Drug Store over phosphate sodas and a shared bag of Wise potato chips. In the process of reliving the fun we had together and the hopes of capturing it again in the future, we became close friends, probably the best overall outcome of the whole experience. But seeing those young guys ever again was not to be. As fervently as they had promised in their letters, even telegrams, that they would return and as much as we hoped it would be true, time stretched into months, then a year, without so much as a glimpse of them again. The number of letters and photographs we exchanged dwindled along with our initial excitement until the memories moved into the background of our minds. When I finally realized this was the case, I asked my diary, “Now what will we do?” In hindsight, I can answer that. We can –and did– live out the rest of our lives in even more compelling ways and in far different places than we young and innocent girls could ever imagine. In 1992, I traveled through Pennsylvania with my daughter and husband, stopping at the places I had lived long ago: Wheatland, Sharpsville, and Cleveland. In Sharpsville, I had a delightful reunion with two friends from my school days, one of whom was featured in this story. My friend and I reminisced about the Canadian Boys Event of 1955 and the range of emotions we felt at the time. Not only did those and many more shared memories reignite that long-ago friendship but they also indicated to us how much we have — and haven’t — changed in the sixty years since that time. Nice writing Ann…I really enjoyed this post!